Ours is an economy where more value is placed on the things we do than things we have. Consider: More than three-quarters of Millennials would rather spend their money on an experience than a material item. And it’s not just often-cited Millennials: 44% of all consumers (including Boomers) want more than an experience, they want a “wow” experience, and Gen Z (those born after 1995) prefer brick-and-mortar exchanges to those found online. But here’s the catch: Those brick-and-mortars have to amp it up. Basic and bland won’t cut it. No matter the generation, people crave immersive and entertaining spaces that elevate the ordinary, everyday experience into something much more meaningful. 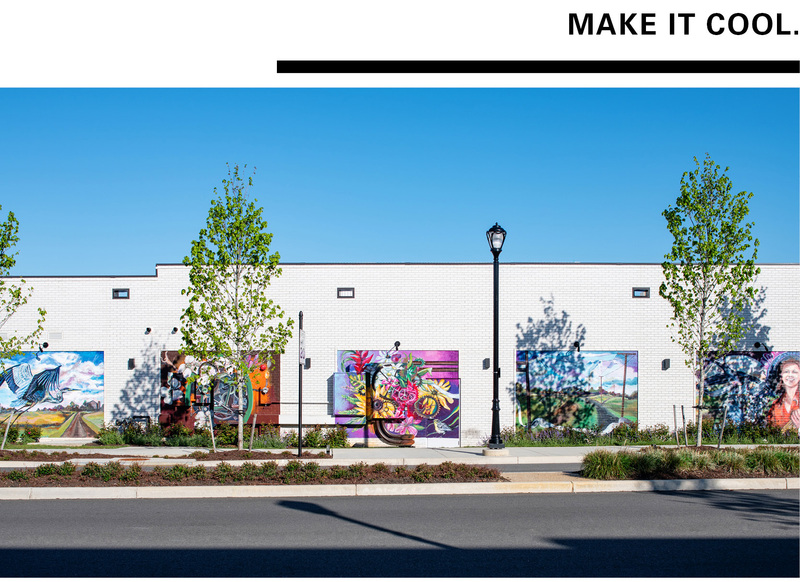 With 100,000 SF of retail and restaurant spaces across seven architecturally-distinct buildings, The Row at GreenGate has quickly garnered attention as one of Virginia’s most impactful projects of the year. 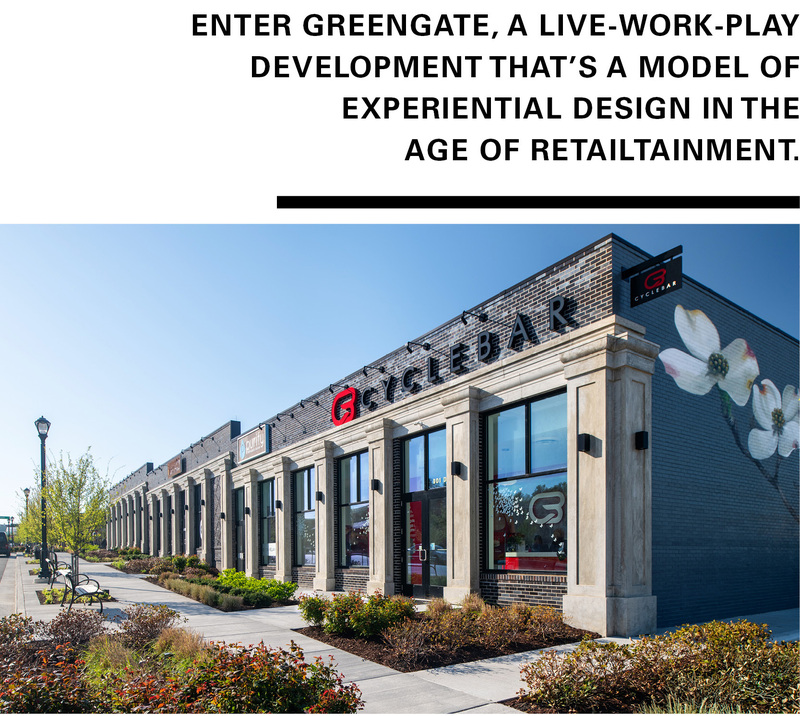 Heavily influenced by quickly shifting demographics and a return to walkable, human-scale built environments, the 75-acre suburban GreenGate evokes the culture and experience of a small, thriving downtown district. We’re sure you’re wondering how all the pieces came together. Imbuing each building with its own personality to match its purpose without losing sight of a larger undercurrent in the design that contextualizes and connects the overall community—each decision came back to considering what people would be thinking, feeling, and doing within any given space. So how is the design reinforcing and meeting those high experiential expectations? Here, four design principles our community studio took to heart while devising the GreenGate experience. Single-use spaces? They’re becoming increasingly irrelevant as more and more people want one-stop shops for a multitude of to-dos and leisure activities. That’s why The Row at GreenGate delivers a hub of entertaining options for consumers. 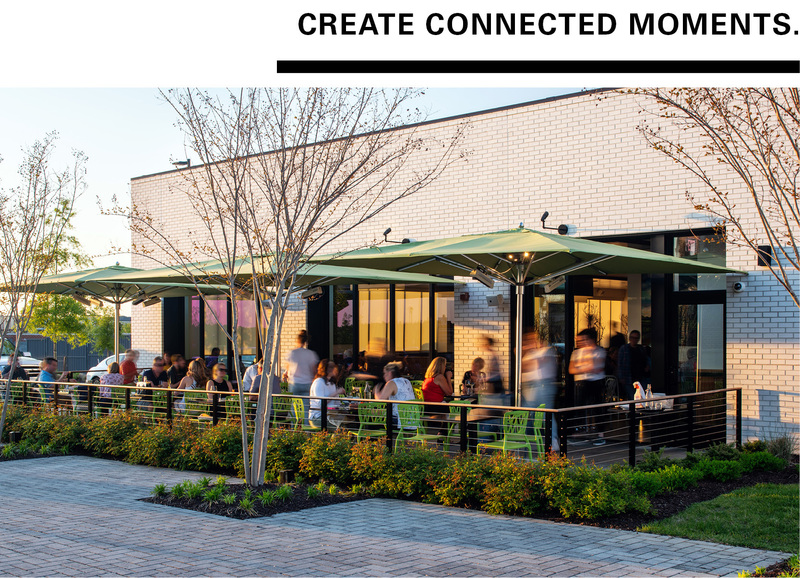 You can drop off your bike to get it fixed, grab a coffee before heading to get your nails done or beard trimmed, then squeeze in a quick workout at a fitness studio before enjoying an al fresco lunch on a sun-drenched patio—all while enjoying the open-air walkability of GreenGate’s master design. The Row’s aesthetic draws from the diverse fabric of architectural styles found within Richmond’s most beloved neighborhoods, including Carytown, The Fan, Shockoe Bottom, and the Museum District. Call it the Instagram effect: When designing experiential retail spaces, you have to consider what features will cause someone to stop in their tracks and say, “I’ve got to share this.” For The Row, we worked with notable muralist Ed Trask to design an entire collection of street art to echo the eclectic portfolio of urban murals found within Richmond’s city center. The Daily Kitchen & Bar (another Baskervill-designed space in GreenGate) followed suit, bringing the fresh appeal of outdoor murals inside their restaurant—a fitting juxtaposition against other design touches like a live moss wall and a row of sculptural trees. Consider this the first chapter in an unfolding story. Richmond, like many cities of its size, is booming and the city’s identity is ever-changing. In the coming months, additional Baskervill-designed amenities (including 50,000-SF of office space and a residential clubhouse) will round out The Row’s retail experience. As GreenGate continues to grow, so will the dynamic design. And the bar for experiential design, says Burt, will only continue to rise with the cornerstone philosophy of today’s experience economy focused on people who are looking for places to be, not things to buy.